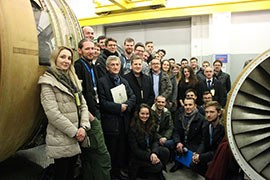 On Tuesday, December 14th, we hosted professors and students from the Faculty of Mechanical Engineering and Robotics (WIMiR) at AGH University of Science and Technology in Cracow. The meeting was held as a part of the EDC cooperation program with selected departments of the best technical universities in Poland. This was the first visit of WIMiR Faculty representatives at EDC. They learned about EDC, visited 4 our laboratories (Materials Technology, Engines, High Pressure and Component Test) and listened to a special lecture about aircraft engines – Designing, business requirements and system engineering. One of EDC Chief Executive Engineers presented his career path and encouraged students to take challenges and to not be afraid of responsible tasks. There was also a time for technical questions and the presentation about Edison program. Our guests told us about research facilities of AGH and education program at WIMiR.